Chandos continue the excellent William Alwyn edition with a programme clearly divided in two. The later part of disc, comprises the suite of 11 Fantasy-Waltzes of the title, a work previously recorded by Chandos in 1985 by John Ogdon. The first 34 minutes are given over to 4 premiere recordings. The works, which span the period 1935-61, are not presented in chronological order. The earliest piece, The Green Hills, is a short nature fantasy, misty water colours which conjure visions akin to Bax in northern reverie. Night Thoughts, written 4 years later evokes similar far away moods, the main theme being marked 'like distant trumpets', though this is music written in reflection of fire watching patrols at the beginning of WWII. Sonata alla toccata comes from the other end of the war, 1945-6, though it was not premiered until the Cheltenham Festival of 1953. Alwyn noted that the piece was written for 'sheer enjoyment', and it is surely not going too far to suggest also in relief and celebration at the end of the conflict. Certainly the work opens with what sounds as if it might be the introduction to a hymn of thanksgiving, before immediately rushing off into a playful and uninhibited dance. The title says it all, Maestoso - Allegro ritmico e jubilante. The central andante is necessarily more sober, even sombre, a reflection perhaps on those who did not make it through the preceding years. The finale, Molto vivace is a real carnival, with a splash of various dances and rhythms working towards a colourfully triumphant and forward-looking resolution. Movements for Piano investigates very different territory over its quarter-of-an-hour. The piece comes from 1961 and is far more unsettled and introspective than the works outlined above. The end of Alwyn's first marriage and the stress of London life had contributed to a breakdown and an inability to compose. This work is part of a journey back towards the light, towards music again. It is therefore a necessarily more romantic work in every sense. There is a continuously dark and questing spirit in the rushing, turbulent waters of the Allegro appassionato. The dark brooding of the early hours captured in evocation, hazy tone colours suggesting the territory of such works as Autumn Legend, the uneasy scoring as close to musical neurosis as Alwyn comes, while the title of the finale, The Devil's Reel itself says much. Music indeed for a satanic dance, relentless, involuted and merciless, the angry finale suggesting a bold return to life. A triumph, but for whom? The Fantasy-Waltzes date from 1956-7, inspired by a visit to Grieg's lakeside home. 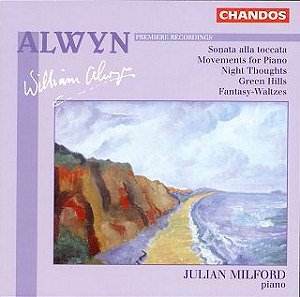 Almost certainly Alwyn's best known piano music, this is a dazzling showcase, a work of constant invention which runs the gamut of moods and styles, yet is always unmistakably Alwyn. The pieces do stand alone, even though some end in disconcertingly flippant ways, but become more than the sum of the parts when heard as part of the complete structure. This is a kaleidoscope, a sustained and thoroughly enjoyable work with all the drama, colour and atmosphere one expects from Alwyn. Underneath it all is a smile, the warmth of a romantic who also knew how to have fun, both facets woven together in the spectacular twists and turns of the closing Presto. It will come as no surprise too learn that this Chandos recording has the sumptuous recorded sound which suits the English romantics so well. Likewise, the relatively unknown - i.e., he hasn't made lots of CDs - soloist Julian Milford acquits himself splendidly, capturing the atmospheric textures essential to such music well, yet equally adept at meeting the demands of the more rhythmically florid and technically challenging dances. This isn't repertoire in which to make a big name for oneself, after all, it's English music, and who cares about that? - so congratulations are due all round to Chandos for continuing to champion Alwyn and to Julian Milford for a thoroughly engrossing recital.